Ok, so following on from my first post on some very stylish UK holiday cottages in both Suffolk and Kent, this time I’m looking at the very popular location of Devon. As a family we’ve had holidays here numerous times and it has to be one of my favourite spots for a UK Family Holiday. It gets busy in the summer that’s true, but we’ve found we really enjoy a cottage break in the Easter holidays when these places are less busy. The weather is often very good, and of course if you have younger children you won’t be restricted to school holidays anyway. The property I’m featuring today is from the Mardens Cottage Holidays website and is called Belle Plage. 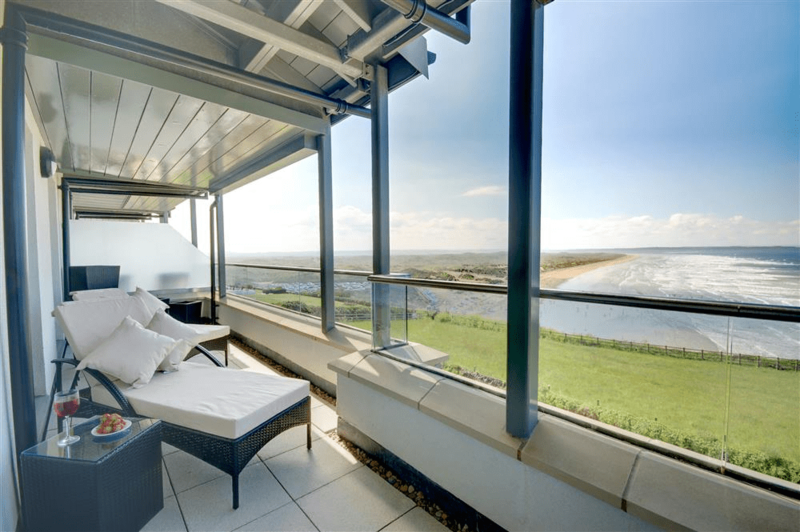 With stunning views over Saunton Sands, Ocean Point is a 2 bedroomed apartment, decorated in a very simple, modern style offering something comfortable and stylish for a family of 4. It offers open plan living, granite surfaces in the kitchen and an en suite bathroom as well as one for the family. Take a look at these views and tell me you aren’t won over? One of the most amazing things about my UK Cottage holidays is being able to experience the outdoors, the fresh air, and the open countryside. Can you imagine how wonderful it would be sitting on this veranda with a glass of wine, watching the sun set over the sea? Even if the weather doesn’t play along it would still be magical to watch the power of a rough sea from behind your glass window. Now there’s only a communal garden with this one, which isn’t always ideal for families but who needs a garden when the beach is on your doorstep? I love this property and I’m not normally one who goes for apartments. The way the fresh, bright decor reflects the view is very clever and don’t worry about the white sofas; they look like leather so can easily be wiped down! If you want to find out more the do go onto the Marsdens website and take a look around. I tend to spend most of the New Year hunting through cottage holiday websites looking for our next adventure and I’ve used Marsdens before. Do you like this property? Are you a fan of stylish UK Cottage Holidays?